To enlarge the résumé text, click once on the image. Twice for further magnification. The year: 1940. 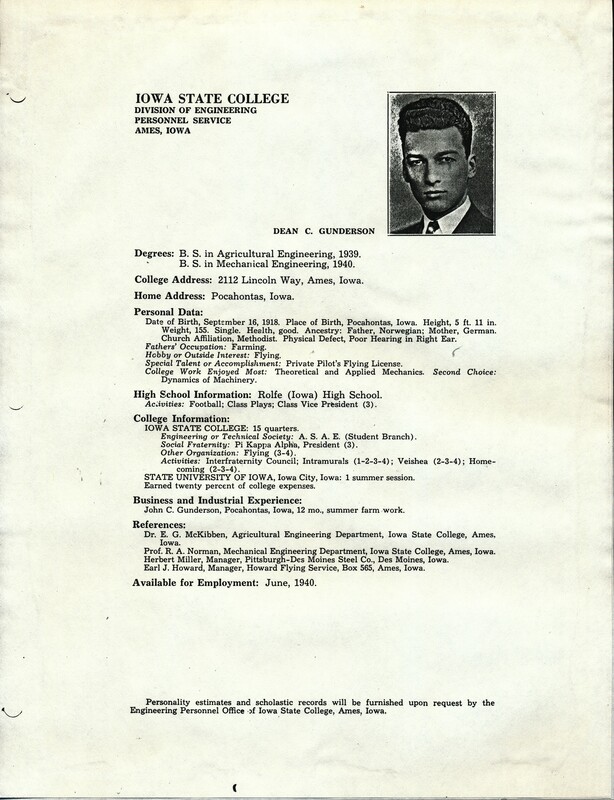 My father’s (Deane* Gunderson) résumé most likely played at least a small part in his landing a job with the John Deere Tractor Company in Waterloo, Iowa. He was an engineer for John Deere from 1940-1945. Can you imagine the looks on the faces of human resources personnel if this résumé came across their desks in this day and age? Forget the looks. What about the potential law suits if in 2011 they did hire him…or if they didn’t?!!! This entry was posted on February 11, 2011 at 7:45 pm and is filed under Uncategorized. You can follow any responses to this entry through the RSS 2.0 feed. You can skip to the end and leave a response. Pinging is currently not allowed. Louise: I would hire your dad in a minute even today. Notice, he graduated from Rolfe High School, that is good for me. I am sorry to say today’s graduate will never measure even close to your dad. He had great common sense, that doesn’t exist anymore. John Deere was lucky to hire him.